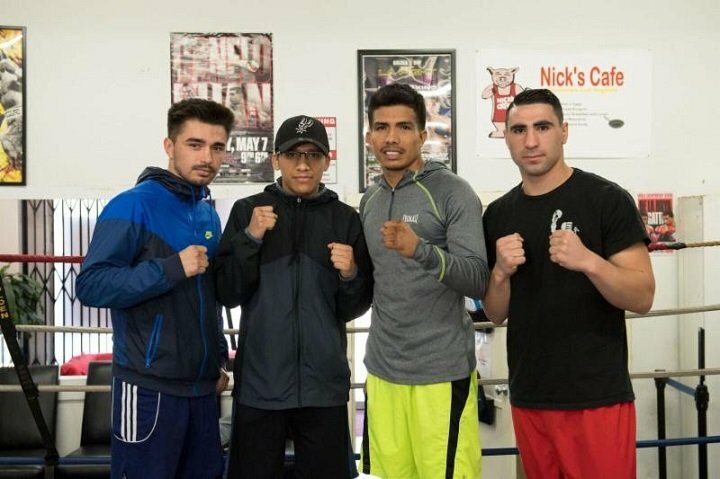 Carlos “The Solution” Morales (16-2-3, 6 KOs) hosted a media workout today ahead of his co-main event feature on the Dec. 14 edition of Golden Boy Boxing on ESPN at Fantasy Springs Resort Casino in Indio, California. The event will be headlined by the 10-round super bantamweight clash between current NABF and NABO Super Bantamweight Champion Diego De La Hoya (20-0, 9 KOs) and tough challenger Jose “Sugar” Salgado (35-4-2, 28 KOs). Several fighters from the stacked undercard also participated in the workout. Ferdinand Kerobyan (6-0, 3 KOs) will face Tavorus Teague (4-18-2, 3 KOs) in a four-round welterweight bout. San Antonio’s Joshua “El Profesor” Franco (12-0, 6 KOs) will participate in a scheduled eight rounds of super flyweight fury against LA’s Carlos “Mighty” Maldonado (9-1, 7 KOs) and East LA’s Jonathan “Thunder” Navarro (11-0, 6 KOs) will engage in eight rounds of super lightweight action against Nicaragua’s Nelson Lara (17-8-5, 9 KOs). Opening up the action at Fantasy Springs Resort Casino, Mexican Olympian Raul “El Cugar” Curiel (1-0) will take on Mexico City’s rugged Israel Villela (6-7, 2 KOs) in a welterweight bout scheduled for six-rounds. “The fight against Alberto Machado was a great experience for my career. It did not go the way I wanted, but I learned from it. We learned to start strong from the beginning, especially in foreign territory. De La Hoya vs. Salgado is a 10-round super bantamweight fight presented by Golden Boy Promotions and Don Chargin & Paco Presents Boxing.The event is sponsored by Tecate, “THE OFFICIAL BEER OF BOXING” and Hennessy, “Never Stop, Never Settle.” The fights will take place live from Fantasy Springs Resort Casino. Doors open and the first fight begins at 4:30 p.m. PT. ESPN2 and ESPN Deportes will transmit the fights beginning at 10:30 p.m. ET/7:30 p.m. PT, and the ESPN3 transmission will begin at 9:00 p.m. ET/6:00 p.m. PT. Tickets for the event start at $25 and are now on sale at the Fantasy Springs Resort Casino box office, by calling 1-800-827-2946, or by purchasing online at www.fantasyspringsresort.com.